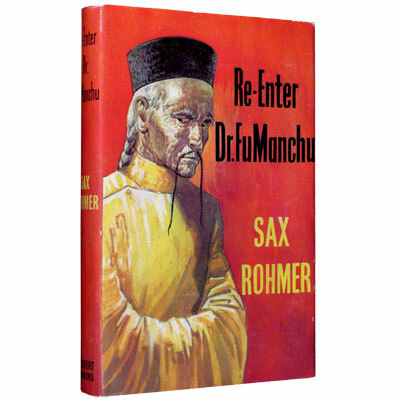 Re-Enter Dr. Fu Manchu - Sax Rohmer (pseudonym of Arthur Henry Sarsfield Ward) 1957 - Herbert Jenkins, London - First Edition	A fine first edition of the thirteenth Fu Manchu adventure containing all of the required archetypes; square-jawed hero, fiendish oriental skullduggery and that particular fascination of Mr. Rohmer, the woman whose main value lies in her ability to fascinate and ensnare ANY man. One can only assume that such women lead a very busy life of constant stress, and being taken under the shadowy wing of the arch-nemesis of western civilisation can only come as a relief. If nothing else it'll filter out all those guys called Chet who are 'only in town for the weekend', gather in sinister gangs in hotel bars and who have strangely pale patches where their wedding rings should be. (thanks to the legendary Jonathan Kearns for this description). Fu Manchu has invented "The Sound Zone" and intends to use it to shield the United States and its allies from direct air attack (which supposedly will render the Soviet Union powerless) and this shift in the geopolitical balance of power will enable the Si-Fan to gain control of the Near and Far East. He plans to kill the President of the United States with poison gas too. References: Reginald, Menville & Burgess, Science Fiction and Fantasy 12389. Not in Day. Bleiler, Checklist of Fantastic Literature.